Underwater hunting without bottles can be practiced by all. This blog post is for you if you want to learn how to get started with spearfishing. If you are equipped with a mask, wetsuit (depending on the temperature of the water), and the Hawaiian sling, you are already well underway. You can of course also choose to invest in the latest equipment — there’s room for every taste. It’s incredibly easy to get into and you can dive till you drop! 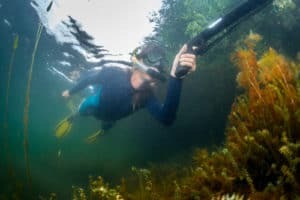 In spearfishing, there are no deco tables, noise, heavy equipment, a time limit, or annoying partner that always wants to go the other way, to take into account. In short – spearfishing will give you a freedom experience and some great scenery. 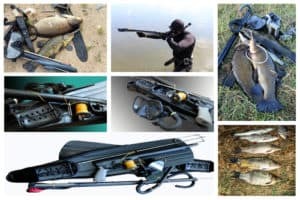 Generally, the best training in spearfishing is the hunt itself. However, not everyone who has the time to go out and hunt for hours a few times a week. 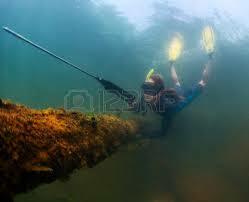 But fear not: you can do much besides diving to keep you in shape for when you can go spearfishing. In spearfishing, your fitness quickly comes to play a major role. If you swim far or in a strong current, it soon becomes difficult. If you are also in bad shape and need to wheeze, your experience is suddenly limited. If you are in good physical shape, you have a lower heart rate and oxygen consumption is less underwater. There are many programs online that can guide you on how to get in shape in the individual sports – so it is just about searching. Though you are in your best physical shape of your life, it does not mean that you are a good underwater hunter. Spearfishing places severe demands on the psyche. A good underwater hunter can control his heartbeat and be completely relaxed when he dives. A good way to learn to relaxe and clear your mind is through meditation. Meditation also have a lot of other benefits. Water acclimatization is a term for the “naturalness” with which you move in the water. 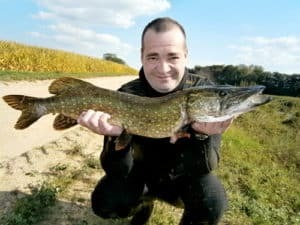 A person who is not accustomed to water will typically be very tense and perhaps even hyperventilate at the thought of having to dive a few meters down to shoot a fish. There is only one way to train water habituation and that is in the water. Go to the swimming pool, do some underwater rugby, aqua yoga, etc. 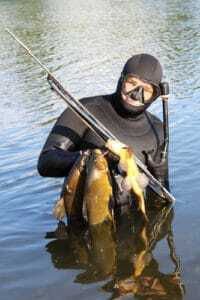 Many immediately see spearfishing as something dangerous. It can be dangerous, but if you are careful it don’t have to be. 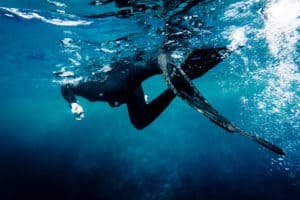 The biggest cause of death in spearfishing is due to shallow water blackout. Shallow water blackout comes from hyperventilating. Hyperventilation confuses the center of the brain that registers how much CO2 there is in your blood which means that you will not feel any urge to breathe – even if you are just about to drown! When diving, your chest gets compressed. At 10m (32,5ft) water, air flow will be halved. At 20m (65ft), it will be 1/3 of what it is on the surface, etc. When air is compressed, the number of oxygen molecules per cm3 air raises in your lungs. That means you can hold your breath longer in deep water than in shallow. In the lungs oxygen and CO2 are exchanged in equilibrium. When one rises up from a deep dive, the air will expand. Since the body has used most of its oxygen and produced CO2 instead, the percentage of oxygen in the body decreases. This causes the equilibrium to go backwards. The body will now absorb CO2 and release oxygen. This condition becomes more and more pronounced the more pressure decreases. At some point, the oxygen content in the blood will be so low that the brain switches off. Blackou! A blackout will often occur just before the surface or on the surface as the pressure here is leveled most. You may not notice a blackout before it comes. Always dive with a partner who can keep an eye on you! Never push yourself to the extreme and know your limits! Current is not uncommon when you are spearfishing. The current can be so powerful that it is impossible to swim against it. Current in itself is not dangerous; however, it can be dangerous if you have a boat with you. If you experience current, it is a good idea to use an anchor. A sea anchor is a device that lays on the bottom and is towed behind a ship. The anchor is intended to reduce speed. Keep your eye on the boat. In the event that the anchor is jammed, it is also a good idea to keep behind the boat. When a speargun is shot on land flies very far. 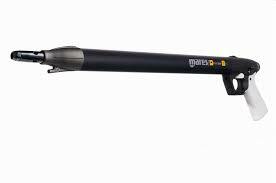 (A compressed air harpoon will be destroyed). Therefore: remember to always discharge your harpoon before walking out of the water. Underwater the harpoon is dangerous too. Never trust the safety on the harpoon; discharge it instead. Keep an eye on your partner and keep well away so he is not within shooting range. When you are underwater, you can hear boats from a distance as a hum. But the sound goes too fast for you to hear from where it comes. 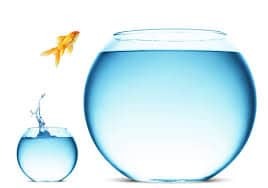 A boy or float can help you stay visable for people on the surface. A float/boy is marked with a flag indicationg that a diver is underwater. This will help you avoid being hit by a boat when you are decending from a dive. Furthermore floats/boys are mandatory by law when you are spearfishing. 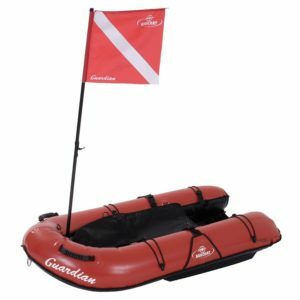 Unfortunately, many boat owners sadly do not know what a dive buoy means. Therefore, always look up when you rise to the surface and be very careful not to bump into anything. 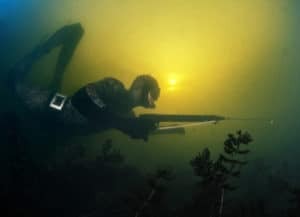 Spearfishing is freediving with a focus on hunting. 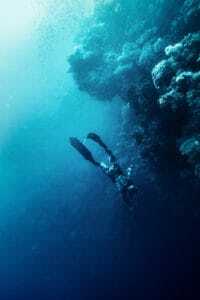 Therefore, techniques to hold your breath are borrowed from free diving. Below is a brief review of how to get more out of your dives. When you lie on the surface – concentrate on breathing with the stomach and relax the body. At the last big breath you can pack more air into the lungs by taking some small mouthfuls of air (feels like you are “eating air”). Bend the body and swim till you sink. When you sink you can make yourself streamlined and fall to the bottom. When you dive deep – you can control the decent with your fins. By putting an angle on the fins you will sink in a spiral. If you do not spot any fish on the way down, let yourself descend to the bottom and lie still, as it piques the curiosity of any fish. It is an advantage to have wheels on the harpoon or line attached to the harpoon. This way you don’t need to think about the fish you shoot when in deep water. Like hunting on land, you want the fish you shoot to suffer as little as possible. Therefore, you want to hit the fish so that it dies immediately. This is both from a human perspective, but also because some fish species can tear itself apart and escape if you are hit it the wrong way. This is of course very bad for the fish, and frustrating for you. The fish usually gets loose because it uses the harpoon spear as a form of crowbar. Therefore, keep the line loose and possibly swim after the fish to keep the line slack. One of the best places to shoot a fish is in the skull. A shot that hits the skull will immediately paralyze the fish so that it becomes rigid. If you shoot a fish in the backbone, the spear will tear or damage the spinal cord of the fish. This will make the fish become paralyzed and it will lie completely still. Hitting a fish in the back will kill it immediately, but it will swim around a bit. The fish spine consists mostly of muscle tissue and the spear will sit tight. 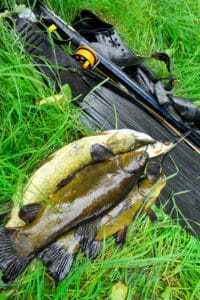 If you shoot at a swimming fish there is a risk of hitting the fish further down than intended, since it can be difficult to judge the speed. The tail is pure muscle and the spear will sit firmly. Some types of fish that are very narrow are easiest to hit in the tail. If you are aiming further ahead on this type of fish, you risks hitting the belly (not good – see below). If a fish is hit in the tail, you may want to use your spearknife to kill it completely. Insert the knife into the fish’s skull and turn it around. Sometimes this can be hard to do in the water when the fish is smooth and there is nothing to hold it with. The belly is the worst place to shoot a fish. In the belly there are almost no muscles and the spear will not sit tight. In addition, fish entrails in the belly are loose and they’ll get pulled out with the spear. Fast and strong fish are at risk of tearing themselves apart and will flee when hit in the belly. The fish can only tear itself apart because it uses the spear as a crow bar. You should therefore, get ahold of the wounded fish as fast as possible. Generally speaking, fish like to hide. Depending on where you dive, this can be in caves, under/between rocks or between coral. If there are rocks on the bottom, it means there are lots of caves among the rocks where the fish can hide. If there is a chalk base, the current can create caves or just detached stone with cracks under. If you are looking for fish in caves, it is good to have a small lamp with you, to light up the cave. 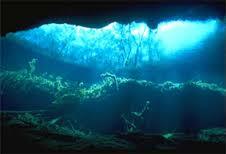 You will be amazed by how small caves can contain fish! Once you have found a cave or crevice that looks promising, you gently move the lamp inside while you are ready to shoot with your speargun. If you have a long speargun it can be difficult to hold the harpoon and lamp simultaneously. Holding your speargun along the cheek and firing with your thumb is much easier for you. Shoot the fish when you find it. It is best that you shoot the fish in the same dive as you find it, otherwise it may well escape. Try to hit the fish in the neck, as it will make it easier to get it out of the cave/crevice – especially if the fish is big. If you do not have air to shoot the fish in the first dive, you can put something in front of the cave (for example your speargun or lamp). The fish in the cave dare not come out because it thinks there is something waiting for it. Can’t get the fish out? Sometimes you will find that it is physically impossible to get the fish out of the cave and you need to dig or move pebbles to get it up to the surface. It is not uncommon that it may take a few dives before this is achieved. There are, of course, also fish that are free-swimming. For those there are some other techniques you can use. Espera is Spanish and means to wait. The technique is good for free-swimming fish that are active, for example, cod and mullet. The tactic is simple and utilizes fish curiosity. You dive down to the bottom. When you lie on the bottom, it is important that you do not seem threatening. No sudden movements, don’t make direct eye contact, and try to look smaller. Tapping your weight belt/mask with your speargun. Playing guitar on the harpoon elastics. Swirling sand in front of you. Scratch two stones against each other. This technique is good for cod fish, trout, and mullet. Do not push yourself to the limit! REMEMBER – no fish is big enough to risk a blackout. It is not uncommon that you have to go deeper than 10m (32,5ft) to catch a fish. Some places in the Mediterranean are so overfished that you must go deeper than 20m (65ft) to find fish bigger than sardine size. The deeper you dive, the greater the water pressure will be. This means that the water pressure will push your lungs and neoprene in your wetsuit together which will give you negative buoyancy. Negative buoyancy means you will sink to the bottom if you are not doing anything. It also means, that it is much harder for you to get to the surface again. If you are at 20m (35ft) it may feel as if you have 5 kg extra lead to lug up. Reduce the amount of lead. Delve deeper slowly in line with experience.